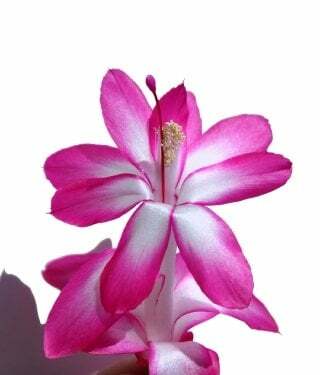 Christmas Cactus plant (Schlumbergera) is a wonderful blooming plant that grows in the winter. The flower is a very beautiful winter flower. On each stem hangs a brightly colored trumpet shaped flower. The flowers come in shades of reds and pinks. Some grow to be white. When this plant begins to grow, the stems first grow straight up and down. Then, as they grow longer, they begin to droop over. Not in a bad way! It actually makes the plant look sort of elegant. The stems are not your typical rounded shape. They grow in a flat shape. The leaves grow in a light green shade and have teeth on the edges. The teeth on the edges are not small and close. They are slightly bigger and are spaced a little ways apart. Plant Christmas Cactus in well-drained potting soil. A mixed potting soil will benefit the plant the most. Take Care of Christmas Cactus all all year by keeping it in sun light during the day and in a darker spot at night. They do not like to be in cool spots though. Keep your plant in a room with warmer temperatures. Not a spot that is too hot, maybe in a room with temperatures around 65 – 70 degrees. You can get away with only watering this plant about once a week. Sometimes maybe every other week. When you see the leaves beginning to look shriveled, water it! If the plant every stops growing, it is just because the plant needs to rest. Don’t worry; it will begin to grow soon. Water it a little bit, and regrowth will resume.